The story of letterpress printing in the western world can be traced back to Johannes Gutenberg. Gutenberg was the first to use movable type printing from individually cast, reusable letters set together in a form in 1440. The method that he developed formed the basis for hundreds of years of printing. Letterpress printing remained the primary way to print and distribute information until the 20th century. Letterpress printing has a few qualities that set it apart from modern, offset document duplication. With an experienced designer and reasonable expectations, your custom job can utilize these properties to create a truly unique finished product. Probably the trait most associated with modern letterpress printing, debossment is the indentation left in the paper by the plates used to print your design. While most people expect this to happen with any letterpress printed item, the fact is that in order to have a deep deboss the correct paper must be used. If this is something you’re looking for in your finished product, let us know so we can get you an accurate quote. Letterpress was made to print letter forms, so it does a great job of printing thin lines. It does not do a great job at printing large, flat, areas of color. If that is part of your design, the center of the flat area will have what printers call "saltiness”. This is where the ink will look patchy in the middle of large printed areas. Some liken it to a dusting of snow on a lawn. You’ll be able to see your large shape, but it will be flecked with spots. Some designers prefer this aesthetic! If you require large areas of color without saltiness, we are happy to help you find a printing process that works with your design. All letterpress inks–except for black–have some transparency. This means that ink colors will change depending on what color paper they are printed on. It is possible to overlay colors to create a third color in your design without the added cost of adding a third layer of imagery to your project. We’re happy to help make the most out of your custom design and troubleshoot the best use of transparency in your project. Letterpress works best for items printed on paper. If you have a cool idea for printing on something other than paper, let us know and we’ll try to figure out a way to make it work. All designs must be created in a vector program and sent to us as a PDF with all fonts outlined. Letterpress cannot hold extreme detail. Any line width smaller than .25 points is not recommended; similarly any font size smaller than 6 points is not recommended. Each piece of paper printed on must pass through the press by hand individually. For every additional color desired the entire run must pass through additional times. Traditionally letterpress is limited to 1 or 2 colors. More colors means more human labor, more passes through the press, more design and prep time, and higher cost. We utilize the Pantone Color Guide and mix our own colors. If you must have a very specific color, we can order premixed ink at cost but we have yet to find a color that we can’t make. 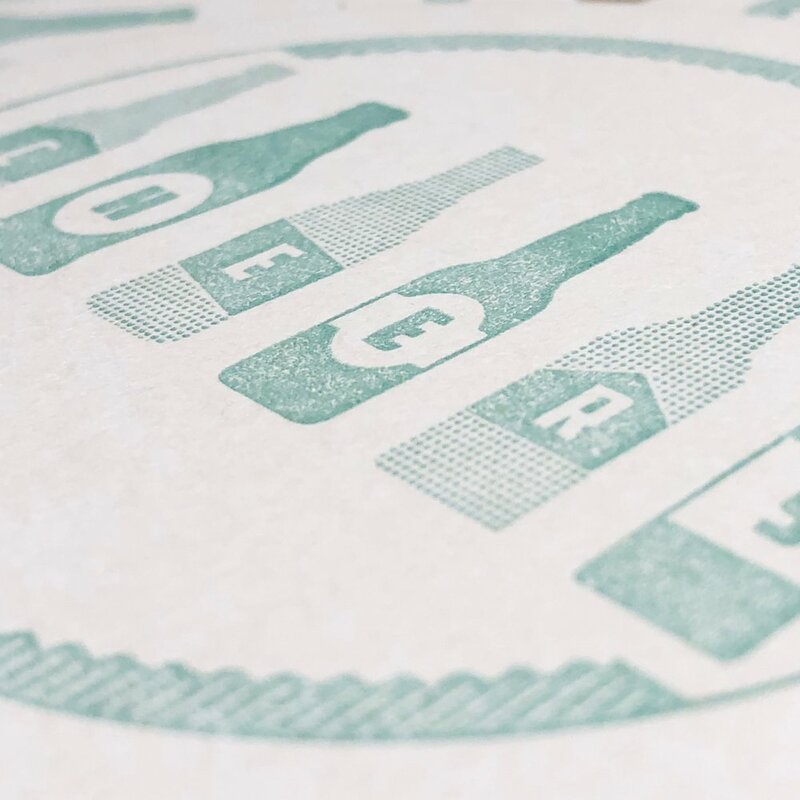 Letterpress excels at printing colors at 100% opacity. If you need to use shading you must use a halftone to achieve your shaded effect. Letterpress also excels at printing dark ink on light paper. If you want light ink on dark paper, be prepared for the paper show-through, or what letterpress printers call “saltiness”. If using a pure white ink or metallic ink, we can run a piece through the press twice, at an additional cost, to create a more dense color. Large solid areas of color do not lend themselves to letterpress as the paper tends to show through. This can be desirable. These areas can also cause buckling in the paper because it stretches the paper thin. You may also notice that the tactile impression appears and feels less obvious than the impression of words or images comprised of thin lines. If you’re printing a piece larger than 8″ x 10″, please consult with us about what maximum paper size you can use for your design. Depending on the nature of the artwork and the quantity we’re printing, we can recommend a format that works well for our equipment.